I thought I'd take another creative look at CPS100 - this time removing the panels and replacing them with my Baroque Motifs stamp. 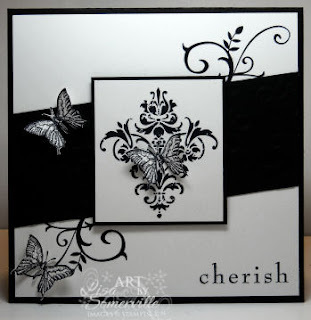 I really like the look and simplicity of black and white cards, I think they have a lot of WOW factor. Of course the butterflies from Dreams Du Jour were just begging do be added to this card. 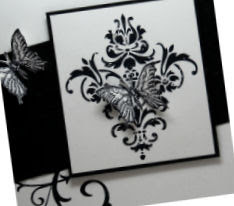 I often find myself reaching for these little butterflies when using the swirl image from Baroque Motifs. This card is stunning, I saw it after I posted mine on Flickr and had to find your blog! Beautiful work, TFS!!! My goodness - another winner card! The little butterflies are the perfect touch. ooooooh....this is Uber pretty! very classy!